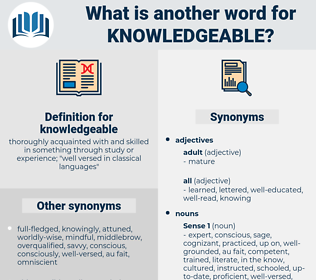 What is another word for knowledgeable? thoroughly acquainted with and skilled in something through study or experience; " well versed in classical languages"
aware, knowledge-based, sophisticated, well-educated, well-qualified, relevant, expert, discerning, enlightened, briefed, known, responsible, reliable, educated, knowledge-sharing, cognizant, specialized, circumspect, knowing, specialised, better-informed, information, knowledge-, well-versed, credible, appropriate, conscious, prudent, concerned, senior, thoughtful, intellectual, scholarly, skilful, mindful, awareness, conversant. well-informed, knowledge, competent, seasoned, skilled, well-trained, qualified, Familiar, experienced, savvy, proficient, capable, trained, literate, abreast, talented, wise, specialist, know-how. senseless, uninformed, unknowledgeable, neglectful, stupid, unaware, dull, slow, foolish, unsophisticated, ignorant, unreasonable, unwise, unintelligent, uneducated, inexperienced.